Support for you during your stay. For assistance in booking your trip, planning details for your visit, or to see what is happening in the region during your stay, the Visitor Information Centres are there to assist with bookings and general information. Services offered include booking tours and accommodation, gifts & souvenirs, assisting with brochures and maps, and providing advice regarding National Parks, events, hire and things to do and see across the region. All centres provide their general information services free of charge. The McLaren Vale & Fleurieu Visitor Information Centre also offers an on-site cafe for hungry travellers. 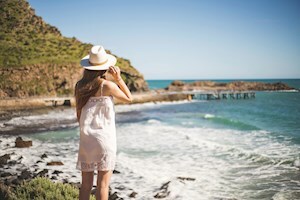 Just 45 minutes from Adelaide, the Fleurieu Peninsula is a gateway for all kinds of year-round fun. Choose from world-class wineries, picturesque townships, surf, beaches, national parks and coastal scenery.